The first images of France's The Triplets of Belleville, Sylvain Chomet's sublime first feature, are immediately magical: a shimmering, knowing homage, drawn by Chomet's cartoonist staff, to the beginnings of sound animation. A woefully scratched piece of archaic, black-and-white celluloid unwinds on screen. It's a wobbly, primitive, early-1930s cartoon, in which a crudely caricatured audience at a vaudeville house bobs and wobbles in rhythm to the live show. On stage, a Fred Astaire figure lithely tapdances, a Django Reinhart lookalike strums some hot-licks guitar, and, in the spotlight, a trio of odd-looking female siblings partake of Andrews Sisters-style harmony. The song they are crooning concerns a mythical city of Belleville. The language? It's what everyone speaks in the movie: a sort of muffled, pidgen French. Where the beginning animation was frenetic, herky-jerky, Triplets now slows down to a pensive, storybook-reading pace, and the images resemble pen-and-watercolors discovered in finely illustrated children's books. (I think of that Gallic classic, Babar the Elephant.) The two characters who live in this house are three-dimensional and carefully individualized. Our protagonists. An aging Grandmother, whose failing eyes and thick spectacles have melted together over the years, perched high on her wrinkled forehead. A pudgy, serious little boy in shorts, Champion, with melancholic, saucer eyes, and a squiggle of a chin. Triplets is, by conscious design, extremely low on dialogue, 99% visual. So there's no conversation about how Grandmother and Champion came to be living together, and what happened to Champion's parents. But Champion's obvious loneliness is soon alleviated by Grandma. She purchases a hound-dog puppy, Bruno, which evokes from him a tiny smile. She buys Champion a tricycle, which makes him, forevermore, possessed and obsessed by peddling about. A grandmother, a dog, a petite boy? Triplets has in place all the ingredients for a facile, crowd-pleasing, family cartoon. But pandering to a G-rated audience is not Sylvain Chomet's plan. Triplets is never cutesy, and certainly never sentimental, and none of the characters are there to win your heart. Instead, Triplets has a flow of weird, grotesque images which probably will chill, and turn off, a mainstream audience of all ages. Chomet's film is "alternative adult," as if there was such a category. Meanwhile, Bruno grows into a daft, clumsy, overweight canine, whose hours pass in a dog day way, with him trotting a hundred times to a window and barking at a passing train. Champion, almost nonsyllabic, grows tall, very thin, but with muscular balloons for legs. He's gone from kid tricyclist to adult competitive bicyclist, and Grandmother acts as his trainer. Finally, when the time is ripe in Triplets, there's a second-act plot. Champion races in the Tour de France. And when he's climbing through the hills, he, and two other unfortunate racers, run afoul of kidnappers, who place them in a truck, then an ocean liner, bound across the water for....? Grandmother and Bruno, following Champion's scent, go in pursuit, crossing the sea in a paddle boat. My favorite animated sequences in Triplets are disparate ones. The grand, topsy-turvy opening, described above. A long, very funny scene (all who've had a pet will recognize it) in which Bruno anxiously prowls the dining room, trying, by odd doggy noises and body language, to nudge his distracted owners to fill his food bowl. And the spiritual moments on a painted ocean, when Grandmother and Bruno toss-and-turn through a Melvillean storm, ride atop a Biblical whale, to the soaring sounds of Mozart's Mass in C Minor. At last, for Triplets' third act, everyone-kidnappers, the kidnapped, Grandma, and Bruno-abandon ship for Belleville. Here's another magical animation creation: a baroque metropolis which is somehow a composite of Paris, New York, Montreal, and Quebec City. How can grandmother and dog rescue poor Champion? With the help of the actual Triplets of Belleville. Decades have passed, and the popular 1930s singing trio (the beginning of the movie) are, in the 1950s, three white-haired shopping bag ladies who share a slum apartment. And here's where the grotesque comes in: their flat includes an unflushed toilet deep in dung and swarming with flies. Their nightly cuisine is frogs and more frogs: frog soup, frogs on a stick, frogs dead, frogs squirming, frogs half alive. Gross! But Grandma, Bruno, and the eccentric Triplets to the rescue! They plunge into a den of thieves! The movie ends with one and all driving into the countryside past a road sign, "Belleville-Thank You For Your Visit! Come Again!" I'd really like to. I don't require another Lion King, or Pocahontas, or the return of Nemo. 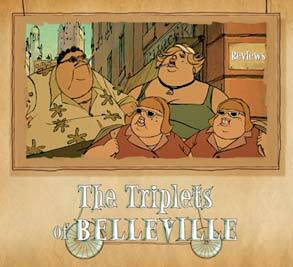 But here's wishing for a Triplets of Belleville 2.